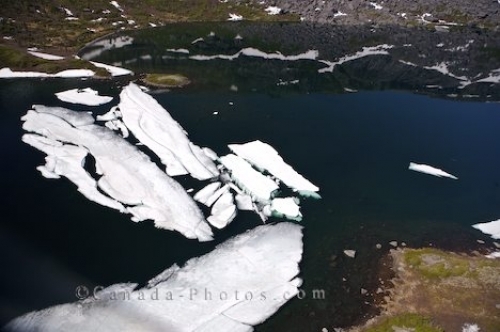 An aerial view of the large chunks of ice that sit upon the surface of a lake that adorns the scenery of the Mealy Mountains in Southern Labrador. An aerial view of a lake in the Mealy Mountains in Southern Labrador where the ice has not melted yet and large chunks still remain on the surface of the water. The landscape around the shores of the lake still have ice patches that will continue to melt as the weather gradually will get warmer. Aerial view of a iced up lake in Mealy Mountains (in July) in Southern Labrador, Labrador, Newfoundland Labrador, Canada. Aerial view of the ice that has covered part of the surface of a lake in the Mealy Mountains in Southern Labrador, Canada.